I have decided to offer my latest piece as a signed and limited edition print run. I have printed 100 copies onto 24" x 18" matte print. 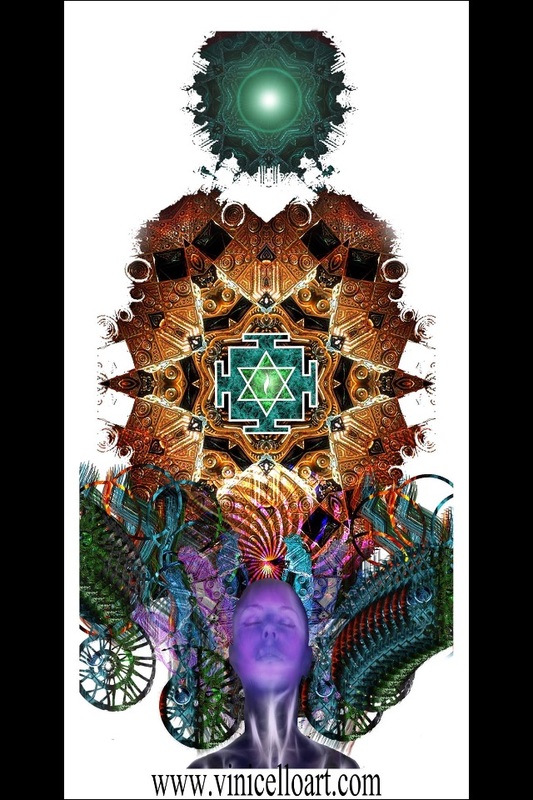 I will be auctioning off up to 10 prints of this limited run; so please share this post with friends to be eligible for a free copy, or go to my Visions page at http://www.vinicelloart.com/avail…/the-divine-is-in-the-code to purchase this limited edition print. I may print this onto different mediums at a later date, but the print run is limited. Include the #divineinthecode when sharing this piece. This story is a bit long and admittedly pretty crazy, but it happened to me and over the years, I've felt more and more confident to share the experience. In the early fall of 2010, I had an incredibly profound experience which forever changed my life. It took me a number of months to piece together the experience and put it back together for what it was.....and what it meant. At the time, I struggled to be normal since what I saw was so expansive, so mind-shattering and so confusing. It was like having hundreds of thousands of years of experience compressed into one day. I was camping with a group of friends at a small music festival and during one afternoon, I suddenly got a strong draw to go back to my tent to see my girlfriend. As I stepped in and made myself comfortable, I quickly went into a deep meditative state and was whisked away from my body. Soon after, I was in the complete emptiness of space....as a witness to the calm....the silence. Suddenly, a grand explosion took place and I was at the middle of it. It was as if the explosion contained all....all thought, all experience, all knowledge. This quickly progressed to whirling balls of gas that started to spread and spin across the vastness of space. It seemed to go on forever....and I could see the universe evolving...into millions of galaxies, billions of stars, yet I was able to see it all at once, as if I was the awareness of all that was. It eventually led to the formation of the planets and my focus then switched to Earth. I was able to see the Earth evolving.....first the form, then the atmosphere....and finally single-celled organisms started to sprout all over. they quickly evolved to more complex life-forms....into plants, trees, into the forests. I could see the plates of the earth shifting and colliding, forming the mountains and hills. I saw the water collect on the surface and start to form pools of water as the cycle began. The organisms quickly evolved into many different beings....first more simple in structure but they quickly became the dinosaurs and the many other extinct beings that we know of..... then the mammals....the primates and eventually us. I then started seeing millions of faces....so many eyes. I was looking at these people and seeing a similarity in everyone. As if each of these people were a part of the same thing....but represented in a unique way. I got a sense that everyone was in a state of confusion.....trying so hard to make sense of it all. I knew that what I was seeing was present day and I could read and hear the thoughts of millions of people at once. I then started to see an innumerable amount of acts between ourselves. The most beautiful things we do to and for each other but also the most depraved and sick acts that we do to each other. Yet, I was a silent observer to it all....non-judging, just observing it all for what it was. I had a knowing that all of it was just experience. almost as if we wondered what the consequence was to our actions.....to see the cause and effect of it all. I then started to see many people I've known throughout my life. many people I have judged for being one way or another, and yet, when I saw them, I loved them for their differences instead of my usual reaction. It was then that I slipped back into my body....but yet, it wasn't as me. I was someone or something else. I faced my girlfriend and started to explain what I had seen and what she had to say about her experience was very similar. I started to hold her and started to get vivid images in my mind of a cosmic event happening then and there. I was something much greater than myself....I was one half of balance... the male aspect....the consciousness, one half of experience and knowledge of all that ever was. Our embrace was a monumental event. she was the other half. the female, the form, the substance. The knowledge she held was much different than mine. our meeting was bringing a change everywhere....in everyone. It was as if our finding each other in human form was THE moment that mankind was waiting for. (or so it seemed). I could see the Earth rejoicing that the end to all strife, all famine and to all hate had arrived. I was not myself but I was Shiva, the God of consciousness.....and I was speaking to my divine lover Parvati. I the God of thought and consciousness and she the mother God of form, of substance. We went back and forth discussing existence....discussing what we knew. The conversation was spoken at times, but telepathic at others. We were sharing stories, books, events.....some I had experienced as myself (Vincent) but some events that took place in history. She would tell me that she could feel the earth shake....feel the waves of the oceans.....feel the animals trampling upon her back....yet when she explained these things, I could see and sense the experiences she described. Our exchange went on for about an hour or two.....as we shared the secrets of life....of existence, of evolution....of all. I remember being quite thirsty throughout the experience but relished in the dryness in my mouth. It was then that I realized how much I enjoyed the anticipations of life just as much as I enjoyed the rewarding experiences. I loved it all....the positives and the negatives.....I loved the uncomfortable moments as much as I delighted in the bliss of life. Once our exchange was over and exhaustion started to settle in, I closed my eyes again and saw myself in a cross-legged pose sitting in space....and then started seeing the eons pass me by. I saw the flesh dissolve from my bones, my bones turned to dust; only to have it regrow on myself again and again, into eternity. I could see the universe continue to evolve around me.....and it truly felt like space and time no longer mattered. I could stop where I wanted within existence but a decade, a century, a millennia were all nothing. Just a sudden glimpse of all that was and all that will ever be. I awoke the next day in a terrible state of confusion. Unsure of if I was in fact Shiva....if mankind had truly been saved. I took a walk with my girlfriend and realized the significance of the moment. That we are all whole....but our World is not seen that way. Each of us represents the male and the female, the yin and yang.....and all life is whole as well but we cannot see it as such. Love and the absenceof love are one, the light and darkness are one, sweet and bitter, winter and summer.....a duality has been created in all things so the experiences can be felt fully; each experience is a coin that has two sides and our human life is such that we experience the extremes of each....I was also able to realize that the whole point of our existence is to see the similarities and differences between us all. To see that we're not separate but that we all represent a part of each other. Your enemy is yourself.....your friends are you......and strangers in the night are all a possibility of you seeing a part of yourself that you didn't know existed. In the end, we will all come together in a loving embrace. For about 1-1/2 to 2 months following, everything in my life lined up perfectly.......everything was synchronistic. I would be at the grocery store and envision a new cashier would appear and two seconds later, one would. I could change traffic lights, think of a person and they would immediately call. Everything lined up as if my knowing that it is all connected allowed me to alter and shift the World to my wanting. It just as quickly stopped and everything went back to the way it was. But I knew that nothing was the same. A few months after the experience, I came across a Hindu text called the Vigyan Bhairav....which is a text detailing a conversation between Shiva and his divine lover Parvati. The book detailed the exact experience that I had had with my girlfriend. I did not know about this book before then.....so whatever it was that I experienced was somehow implanted in me and released that fateful night. In June of 2011, I had a vision of the experience represented as a work of art, and a voice in me insisted that I create this piece. After many hours working on the piece and figuring out how to put it together, I was in awe at the piece that unfolded. The more time I put into this, the more intense was the energy coursing through me. I would literally vibrate some days when I would look at the piece and what had gone into it. Life is a great mandala of interconnectedness.......we all share common experiences and all live within the flow. The piece represents not only the dualities of life but also contains some hidden truths of our World. 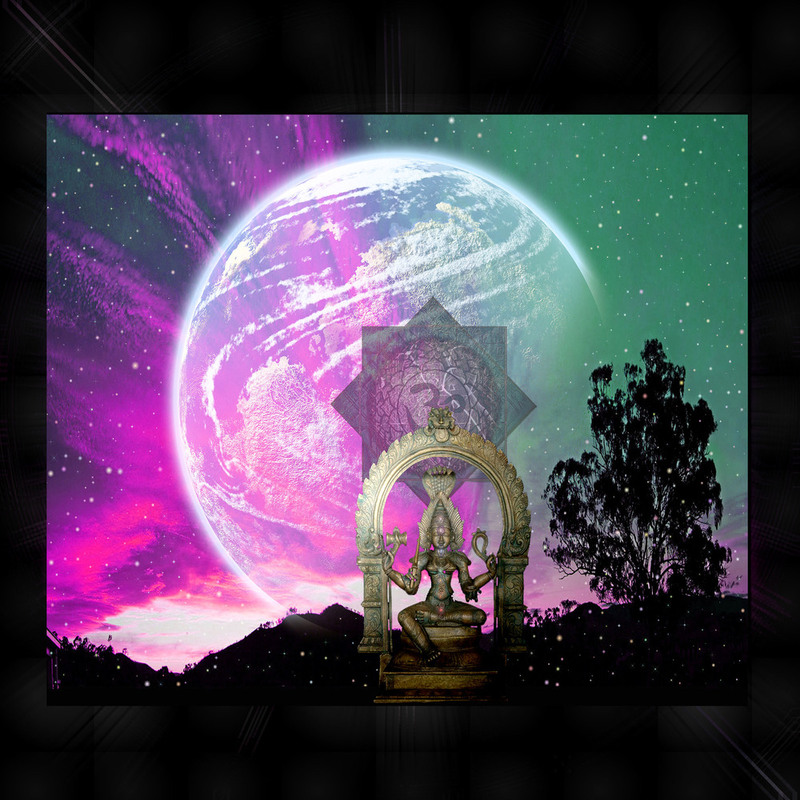 I have included some holy/powerful sites on our Earth, several spiritual guides and teachers throughout the ages.....I have also included some portals to other worlds that I have seen and experienced through deep meditation. In this time of great fear for the fate of mankind....I feel that experiences such as these are spontaneously being had across the globe. The experiences are meant to be shared as they will help us evolve to our true purpose. Since this experience, I continue to journey, to expand my understanding of the World and our Universe. I'm a constant seeker. I feel blessed to have had the experience and to have seen and known such deep wisdom. # 2 is called Vision of the Guru. This one is special to me as it was the last piece I created before I left for my journey to Hawaii, Bali and India. My 3 month journey during Feb-May of 2013 was my own Eat, Pray, Love journey. I spent two weeks with my partner (and family) in Maui, Hawaii, then set off for 2 weeks in Ubud, Bali for amazing yoga sessions, Balinese sights and sounds and delicious food, and finally 2 months in India, where I met a teacher on a level I could not even fully comprehend. I had been studying and reading a lot of books prior to my trip, of people's personal journeys to find their true selves and to discover truth. I spent much of that time asking for a real teacher that could help guide my way. I had taken level 1 and 2 of reiki in Canada, but I knew that I would complete my training somewhere in India. After a week of being in India, I walked through the door of a small reiki school and was face to face with my Swamiji. He seemed very unassuming at first but after I spent a few hours with him, I realized that I had met my true teacher. My (almost) 2 months with the school was a serious journey of self-discovery, healing, serious insights and growth. I felt love on a level that I had never known before. The experience truly changed my life. I look forward to the day when I can return to India and see him again. The piece was the first vision I had of a true teacher. It holds a great meaning to me and I see that it means a lot to many others. May everyone find their teacher someday and know their full potential. I'm a little behind on what was posted on my facebook page. This is my third most important piece. # 3 is called Buddha on the Waterfront. 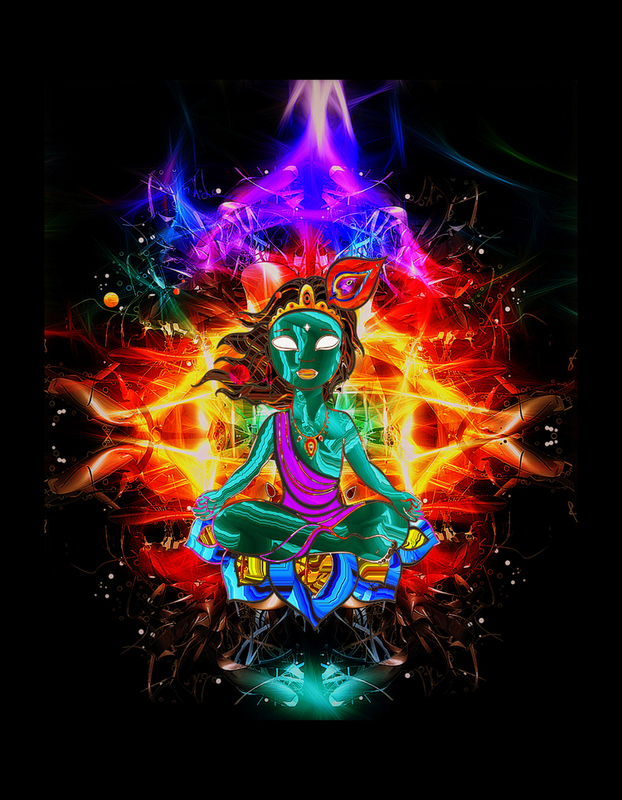 I went in with the intention of creating an "Enlightened Buddha" image back in early 2010. I worked at it over the period of one focused afternoon. At the time, I was really into the show Lost. I felt extremely connected with the characters and many parts of their journeys really spoke to me. When they showed the final episode, with the final scene in the church, the imagery of the stained glass windows with all the faith symbols ( symbols for Islam, Judaism, nature religions, christianity, Confucinism, etc.) really struck a chord with me. It ended up being the last series of small images I put into the piece. The Buddha and his story does speak strongly to me, but so does Hiduism, nature religions, christianity and Taoism. I have tried to open my mind to what speaks to me. I keep listening and trying to find Truth in this World of many deceptions. #4 is called Suddenly I just woke up. The image and the video came together so smoothly. I had been wanting to create more elaborate video images using my art for a long time and this was my first attempt at something this intricate. I created about 70 variations of the original piece and learned some pretty cool tricks along the way. And.... # 5 of my top 15 images is called the Four Seasons. This piece taught me so, so much and was the first piece that really caught in with a lot of people. I know that many people in my life wished that I did more art like this, but I guess it wasn't my path. I've always tried to stay true to beautiful imagery, even when life has been difficult or painful. Sometimes my most honest and powerful images come about when I'm heartbroken or in pain. I've been heavily influenced by android Jones, especially in the last year and this was my take at adapting his style. I love the colour and depth of this piece. It has shown me new avenues on how to bring together a piece, one stroke at a time. I have attached the two versions of the piece I created. #7 is called Spirit Journey. It features various aspects of my life that have led to my awakening. From my discovery and understanding of the chakra system, discoveries of various God and Goddess figures, shamanic and psychedelic journeying, to deep, deep inner journeying, connecting with nature and animals, meditation, and finding so many teachers and guides. My journey expands and broadens all the time as I try to be aware of everything that reveals itself to me and to have the courage and strength to keep exploring and allowing my heart to crack open a little more every day. My life keeps filling with more and more love. I feel so lucky. so, so rich with love and learning. # 8 is called the Divine Feminine. I made this one as part of a stage design for Astral Harvest (http://www.astralharvest.com/), which is an amazing transformational festival that takes place every July near Slave Lake, AB. The festival combines amazing music, art, workshops, yoga, healing, etc. The stage is called Angelica's Basket and the general theme is that of the Goddess Mother. I wanted to showcase the feminine in a beautiful and unique way and came up with this piece. I LOVE the colours and the face in the centre, and how the piece comes together with images of nature. My pieces are all a reflection of ourselves and the World around us. This one speaks to me on a very deep level. #9 is called Merkaba-Sound Light Body This meditative experience was one of the most powerful but confusing states of consciousness "I" have been in. I was sitting in meditation in space as time was passing around me. I could see civilizations form and fall around me, while my flesh dissolved and my bones turned to dust. I was then just an energetic form whereupon my bones would re-appear, followed by my body. It happened again and again, as time continued to pass. I felt like I would live this way forever, just watching the passing of time. Trapped in eternity and just being a silent watcher in it all. whew. just thinking about it is so overwhelming. I felt compelled to include the seed of life in the piece. For those not familiar with sacred geometry and the appearance of the flower of life throughout many cultures and civilizations throughout the World, you should really look into it. It's fascinating stuff. #10 is called Cosmic Peacock. This one has a very special meaning to me. I created it with a dear friend and it turned out better than either of us could have expected. The symbolism of animals was completely unknown to me at the time but since then, I've researched a lot of First Nations and South American animal mythology stories. The ancients saw the peacock as a symbol of immortality and the renewal of its feathers year after year are a symbol of renewal. Many cultures saw the peacock in similar way to the Phoenix. The peacock reminds us that now is the time to acknowledge your dreams and aspirations within yourself. To fully express your creative self. My personal spirit animal is the Hawk. A few years ago I started to see hawks everywhere around the city and one afternoon as I was creating art, a hawk came to my window and started tapping at it. I started to listen then and since, I have paid attention to them whenever they appear. I have featured the hawk in many of my pieces as an acknowledgement and reverence for its beautiful message. The building that my teacher/guru lived in (in Pune, India) was constantly being circled by 20-30 hawks. What a powerful omen that I had come Home. #11 is called Avalokiteshvara- Bodhisattva of Compassion. The idea of the figure really struck a chord with me. The Boddhisatva being a person who has attained the enlightened state but that puts off their own progress by deciding to come back to this World again in servitude of others. The figure is represented with a thousand arms, offering help and support to the World. The various heads signify having attained the all-knowing state. It makes me wonder how many people are walking around with the sole purpose of serving the World. I have incorporated many figures in my art since this one. This part of my life was the opening of a new part of my journey of discovery, which only grows and expands to this day. #12 is called Divine Lovers. 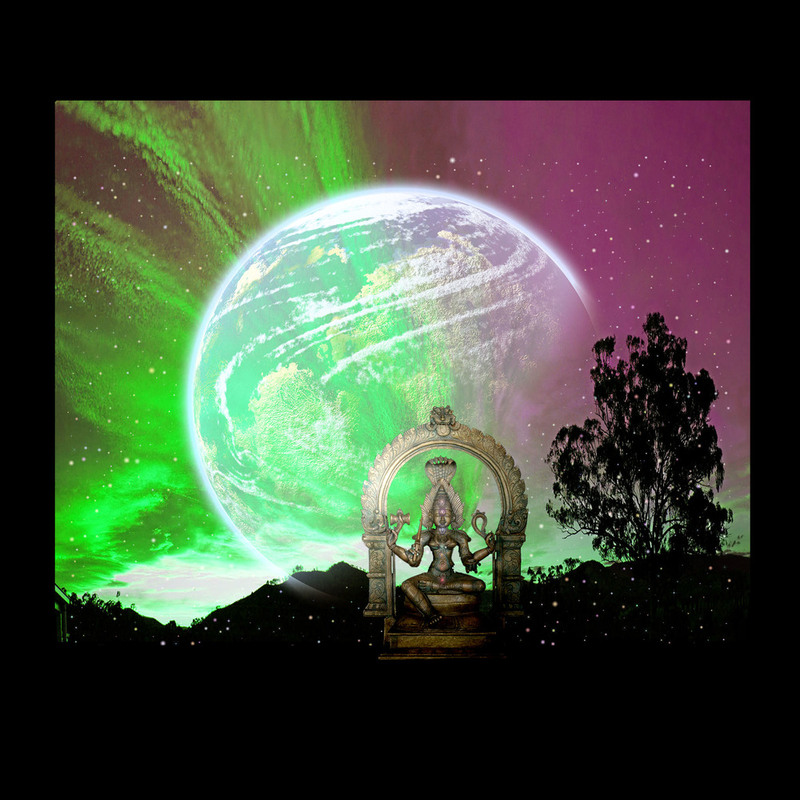 Shiva is sitting with his lover,the Earth, or Mother Earth. The formless and form meeting and being as one.This piece came about following my most life changing experience. It was the first time I tried various versions of the same piece and noticed how effective colour variations could be. # 13 is called Ganesha- Remove my obstacles. The design is fairly simplistic, but it taught me a lot about transparencies and layering images on top of others. The woman is praying to Ganesh, the holy elephant in Hinduism. Ganesh is known to help remove obstacles in life, and a figure often seen in popular culture today. I've printed this piece a number of times onto cloth tapestries and it looks gorgeous. Especially with little white christmas lights hanging behind it. I've spent a lot of time just looking at it and it has remained one of my favorites over the years. #14 is this one entitled Buddha on the Waterfront. I learned and applied various new techniques on this one, and was also learning how powerful the inclusion of sacred symbols, mantras and sacred geometry could be in a piece. The mantra is this piece is Aum Mani Padme Hum, which means "Jewel at the centre of the lotus"
I had been practicing using this mantra while I worked on the 37th floor of an office building downtown. I would find a quiet corner of the office andput on headphones and then recite the mantra over and over, visualizing the mantra coming directly out of my heart. After working with it for a few days, I had this intense energetic experience and felt ripples of energy coming from the centre of heart. When I went back to my desk, I started feeling this overwhelming energy flow starting from my feet and moving upwards, through my body. It intensified as it moved up and up, and I felt moments of incredible fear followed by moments of bliss as the energy passed all the way through and out the top of my head. It was the first time that mantras really worked for me. And wow, did it ever! My pieces are all personal experiences that I try to translate into this form. I try to communicate the truth of the experiences but I know that my art only touches at the true depth. I've got some new art in the works. In the meantime, I wanted to showcase my 15 favorite pieces over the years. At #15....I called this one Bullet Through the Mind. I was just discovering the chakras and had had a series of powerful experiences that opened me in many new ways. These 15 pieces are my most defining work, and the ones that have also touched the most people. It's taken me a long time to feel ready to watch this. I was super-nervous during the presentation and besides, I hate looking at videos of me or hearing my voice recorded. I always feel like my voice doesn't sound like me. do you feel that way too? I finally felt ready to watch it and revisit that part of my life. What inspired the piece was such a shattering experience. so, so powerful and moving. Share it with anyone you feel could hear my story. Karen C has won my first mounted canvas giveaway. Congratulations Karen and thank you to everyone that entered this contest and shared my website with others. Go to my contact page and fill in all the fields for a chance to win a mounted canvas. This will be the first of a possible monthly giveway. I have been working with vectors for the first time and the image below inspired the short video sequence. I am super-proud of this early animation. Some big things are coming through lately.